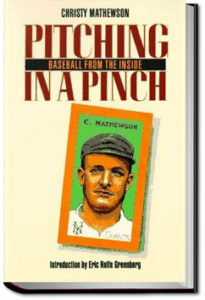 In this book Mathewson is telling the reader of the game as it is played in the Big Leagues…. It’s as good as his pitching and some exciting things have happened in the Big Leagues, stories that never found their way into the newspapers. Matty has told them. This is a true tale of Big Leaguers, their habits and their methods of playing the game, written by one of them.